Clarks Chains. 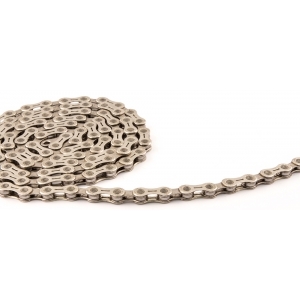 Clarks range of chains is extensive, catering for the requirements of all types of riders. From high performance, narrow 8-11 speed self lubricating chains through to half link single speed chains, all have proven superior resistance to stretch. This results in less wear to all drive train contact surfaces so maintaining accurate shifting for longer. All Clarks chains are supplied with quick release link chain connectors. Self Lubricating. At the point of manufacture these chains are coated with a special treatment of Teflon that has good adhesion properties. The ’internal’ moving parts of the chain are fully lubricated helping to prevent wear and reducing the requirement for further lubrication. This process significantly increases the life expectancy of the chain and components it comes in contact with. Server Time: 21/04/2019 14:10:21, Render Time: 0.009 seconds.